WOULD YOU LIKE A PRINT COPY OF THESE INSTRUCTIONS? Rosaries made from Beads and Cord, or cord alone, are the style most often used by the Missions and are usually distributed for free by volunteer Rosary Makers. The first part of our instruction includes the basics, in particular, learning the barrel knot, building the decades, adding the Pater beads. From there we will link to specifics for a Cord Rosary using a Knotted Center, and a Cord Rosary using a Center Piece. The starting point for the two different style rosaries is different. Our Basic Instructions below will not complete a Rosary. They are intended to illustrate only the basic steps a beginner should take before starting work on your actual first Rosary. Please read through all of the instructions before beginning your first Rosary. The tools used for making Cord Rosaries are made of a sturdy plastic and are available in the the two styles shown. We prefer the style with the thick handle. The tip of the Cord Tool is grooved, forming a "tunnel" through which Cord is thread to form the knots which separate the beads. What Kind of Cord Should I Use? How many rosaries can be made from one bolt of cord? Size 9 cord is just the right size for "mission" rosaries made with the plastic 5 x 7mm oval beads. If you are using wood beads, depending on the size of the hole, this size cord should work for your 6-8 mm beads also. You might try Size 21 also. 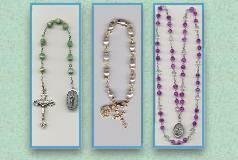 Size 36 is the very thick style used for rosaries made completely of cord...where the "beads" are formed from cord. Bonded Cord is treated with a chemical, that make it feel like its waxed, to help it hold together - it doesn't unravel as easily, its rather stiff and easy to handle. But if you will be making a number of rosaries every day, this cord can be rough on your skin. Hands may become sore from pulling on the cord to make the knots. Non-bonded Cord is a little easier on your hands, not as stiff, but harder to thread through the beads, and unravels easily. It will fray at the ends when you cut it, so you must use clear nail polish to help hold it together. Beads, tape measure and/or ruler, sharp scissors, cord rosary-making tool, Crucifix, and Center. Begin by learning how to make a Barrel Knot. This knot is used throughout the cord rosary, to tie off the Crucifix and Center, and to separate the decade beads from the Pater beads. Practice making Barrel Knots on a spare piece of cord until you can tie one in your sleep. if you make a mistake...but its not easy. once you have completed your rosary! instructions for making a cord rosary with a center piece, or one made with a large double barrel knot as the center will follow in the next two sections. Cut a length of Cord 63 inches long...this will be your practice cord to learn the basic techniques. To make a Cord Rosary using a Center piece, see below for starting point, which is different from a Cord Rosary with a Knotted Center. (or about the length of your cord tool) and mark this spot with your thumb. This will be the starting place for your first knot. Learn to gauge this length by sight, so you won't have to use a ruler as you become experienced. Just as shown, tool in work hand, cord in the other, make a wrap around the cord rosary tool, diagonally, as you will be making an "X" as shown in the next picture. Wrap close together, for four wraps, as shown above. We use 4 wraps for security...but three will work...its up to you and how tightly you are able to pull the knots you make. Insert the other end, the "long end" under the wrapped cord, through the "tunnel" in the cord rosary tool. Pull cord all the way through and out making sure you catch the short end of the cord and pull it securely in underneath the wraps. Give this a firm tug before removing your knot, as shown in the next picture. GENTLY work knot off tool being careful to keep the coiled shape of the knot intact as shown. Keep hold of the short end in your left hand, and the long end in the palm of your right hand. While simultaneously GENTLY pulling the short end, roll knot back and forth between your thumb and index finger, keeping the coils close together, moving the knot into the correct position. You will be able to "slide" the knot to where you want it as long as it is not tightened. When the knot is positioned where you want it to be, begin also GENTLY pulling on the long end of the cord, keeping the knot intact now with your left hand, as shown below. When knot is in final placement, pull HARD on both ends of the cord to secure the knot as shown below. The coils should move even closer together, and the knot will resemble a "barrel." Once you feel confident making barrel knots, you will be ready to begin stringing the first decade. whether you are making a Cord Rosary with a Center Piece, or a Cord Rosary with a large double barrel knot as the center piece. But the starting point is different for each. Below, in Building The Decades, we illustrate the starting point for a Knotted Center Cord Rosary. You may wish to make a Cord Rosary using Spacer Tubes instead of tying knots between decades. A knotted Center would be tied in the same way on this style rosary, as would the Center piece. Refer back to those pages if you will be making a Spacer Tube Rosary. Begin your rosary by tying a barrel knot 8 inches from the end as shown above. Build your five decades as illustrated below, and then proceed as explained above to finish your rosary. After the tenth bead, leave a space about the width of your thumb and hold it. This will mark the spot to begin making the next knot. It is important to leave this small space at the end of each decade so that the rosary will be flexible, and fold easily into one's pocket or purse. If the rosary is strung too tightly, it will not bend where it should. Wrap a barrel knot here just as you did for your first knot; pull hard to secure. Now add one Pater (Our Father) bead. Position your work over the cord tool now with the strung decade beads gripped firmly in your left (work)hand, as shown below. Move the Pater bead close to the first knot, and begin wrapping your next knot right up against the bead, leaving no space. Pull this knot off the cord tool using the same method you learned above. Move the knot as close as possible to the Pater bead. When the knot is in position, pull HARD on both ends of the cord to secure the knot. Proceed along using the same techniques until you have completed all five decades. 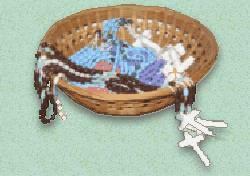 10 packs of assorted color beads, 5 Cord tools, Cord, and fully illustrated seven page Manual.